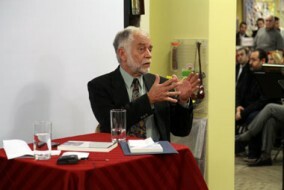 Peace Islands Institute hosted Dr. James Harrington at Ant Bookstore in Clifton on March 1st 2012. Journalist/Writer Aydogan Vatandas interviewed Dr. James Harrington on his book titled "Wrestling with Free Speech, Religious Freedom, and Democracy in Turkey: The Political Trials and Times of Fethullah Gulen". Following the interview, Dr. James Harrington did a book signing of his book. We thank him for his presence.